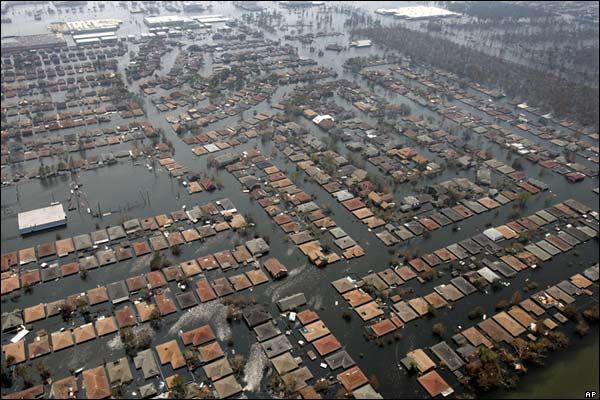 Written in the immediate aftermath of Hurricane Katrina, Neil Smith argues 'natural disasters' are in every aspect social disasters, reflecting contours of class and race. 1. George Bush has declared that “these people are not refugees, they are Americans.” The effort at such a distinction is doubly cynical. It seeks to sanitize the experience of the approximately 400,000 people displaced, evacuated and evicted from New Orleans by bestowing on them some kind of superiority and respect not normally given to “refugees.” It therefore also exposes what Bush thinks of the rest of the world, demeaning millions of others who remain merely “refugees,” a social category presumably lower than “Americans.” That Jesse Jackson should have made a similar argument, albeit in an attempt to establish respect for African Americans at home but at the expense of foreign “refugees,” is disappointing. In 1976, a devastating earthquake killed 23,000 people in Guatemala. The vast majority of deaths were not the direct result of the event itself. Massive relief flooded in, but it was not funneled to the most affected and neediest peasants, who eventually came to call the disaster a “classquake”. I agree with Neil Smith's statement that "One's chances of surviving a disaster are more than anything dependent on one's race, ethnicity, and social class." Hurricane Katrina especially, bares this out when you see who became homeless because of this storm. Help for these people came only very gradually. The tourist section of New Orleans was not flooded, but the low land areas of where the poor lived, were completely flooded over with water.Thousands of people were herded into the New Orleans Super Dome, where there was neither adequate water nor food supplies. Many died in this storm; most of these deaths could've been prevented. Hurricane Sandy was not quite the same as Hurricane Katrina. One way this is so, is many people with money choose to live near the water's edge. That was then one place you would not want to be when Hurricane Sandy hit. People chose to lived there in spite of many warnings about what might happen because of the major hurricane. This hurricane did affect people of all walks of life, who rely on public transportation. Subways were flooded, and the tunnels were also flooded. There were major power outages in different areas, leaving people with neither electricity nor water pressure. Different areas of the boroughs were flooded which made it impossible for the people who lived there to travel. What could of been done to make Hurricane Sandy caused less damage? There are several things. First is, not to live near the water's edge. Scientists have warned about living there. People either did not believe the warnings or chose to ignore them. Even though Hurricane Sandy is different than Hurricane Katrina, Neil Smith is correct when he says that proper planning would have resulted in much less damage.